Small rooms, at times, can be a challenge to decorate. They can provide little storage and they have the potential of getting cluttered quickly. Homeowners have become disappointed with their small rooms, but we are here to fight back. With six quick tips, you can transform your small space into big possibilities. The Tiny Bathroom. In a lot of older homes, you will find that the bathrooms are small with little storage. To combat the small look, buy a rounded curtain rod. The curtain rod will play an illusion on the eyes to make the room look bigger than it actually is. The Magic Flooring. 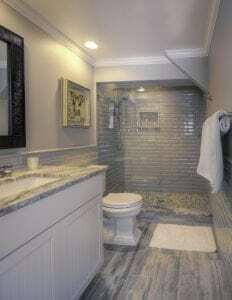 Tile floors can be a magnificent flooring option for homeowners looking to open up their room. The larger the tile you choose for your space, the larger the room looks. You want to try and choose large tiles, but you also want to make sure that you can see enough of them for it to be beneficial. After you have selected the size, you want to choose a lighter color. Lighter flooring can open up your space by reflecting the lighting. Lastly, you want to “walk into the length.” By that we mean, you want the tiles to run long ways to help your space look bigger. For expert advice, be sure to ask one of our knowledge showroom consultants for their help. The Mighty Mirror. Like we always say, mirrors can be the best decorative piece for a tiny space. Not only are mirrors stylish, but they reflect light and help make your space look bigger. When in doubt, buy a mirror. Long Legs. Interestingly enough, you want to buy furniture pieces with legs rather than ones that sit directly on the floor. The long legs on the furniture can help the room feel larger and less cluttered by heavy furniture. Get Vertical. In small spaces, you want to focus on vertical length rather than horizontal length. When in doubt, place your items vertically to expand the dimensions of the room. This visually appealing look can make your room look taller and less cluttered. Remember this tip for your shelving and storage. Through The Glass. Glass furniture, shelving, and decor can be an excellent addition to your room. Since glass is see-through, it tends to open the room up and make the space more inviting. Try throwing in a couple of glass pieces throughout your room to reduce the heaviness of everyday furniture. We would love to help you choose your home’s new flooring. We believe that flooring can be an important step in making a room look bigger and more open. Contact us today for expert advice and fantastic prices.